On January 10, 2019, patrol deputies from the City of Thousand Oaks Police Station and East County Street Narcotics Street Team arrested Travis Trent, a resident of Thousand Oaks and Matthew Robledo from Fullerton for their involvement in illegal activities in the City of Thousand Oaks. On January 10, 2019, patrol deputies from the Thousand Oaks Police Station were dispatched to the 500 Block of Laurie Lane regarding a possible overdose victim. Prior to their arrival, a concerned citizen reported a disturbance and seeing an unknown subject discarding a duffel bag near a vehicle in the carport of the apartment complex in question. Upon arrival, patrol deputies made contact with Matthew Robledo who was visiting at the residence and determined he was not suffering from a drug overdose, but was believed to be under the influence of narcotics. 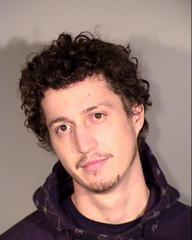 Patrol deputies also contacted Travis Trent who lived at the residence. Patrol deputies contacted and interviewed the occupants. Patrol deputies were diligent in their investigation and quickly determined narcotics sales activity taking place at the residence. Narcotics Detectives were summoned to assist with the investigation as well as an Investigator from the District Attorney’s Office Bureau of Investigations. Patrol deputies found the duffel bag in question and found it had been discarded near a vehicle belonging to Trent. Inside the duffel bag, deputies located two firearms and a large quantity of Codeine syrup. Codeine syrup is highly abused and is illegal to possess without the proper prescription from a medical professional. The duffel bag and the contents were determined to belong to both Trent and Robledo. 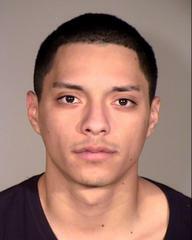 Detectives ultimately conducted a search of Trent’s apartment pursuant to Trent’s Ventura County probation terms. 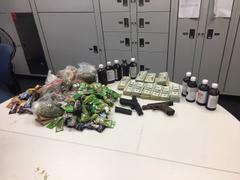 In all, detectives seized 238 grams of concentrated cannabis, 1,484 grams of marijuana, 4.8 grams of Psilocybin mushrooms, 120 ounces of Promethazine/Codeine syrup, two unregistered firearms and a large quantity of money believed to be proceeds from narcotics sales. Detectives also seized evidence indicative of illegal narcotics sales. Trent and Robledo were both ultimately arrested and booked at the East Valley Jail on various narcotics and firearms charges.